Find many romantic Christmas greetings and wishes for your boyfriend, husband or your lover to celebrate the most romantic time of the year. Send your warm and sincere greetings to the man of your life and let the Christmas spirit cover your soul and feelings. The examples below will give you unique ideas of Christmas wishes and greetings to help you compose your own unique message for your unique man! 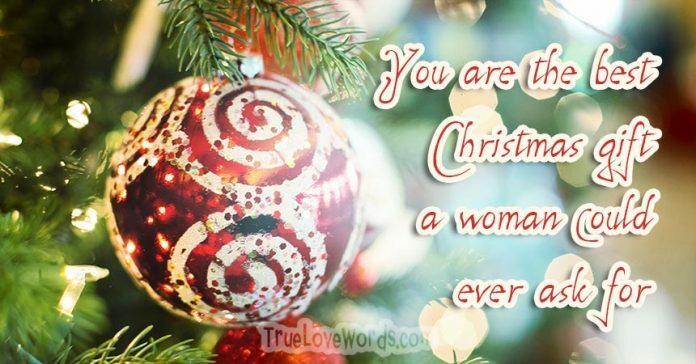 ♥ You are the best Christmas gift a woman could ever ask for. Thank you for making my Christmas wishes come true! ♥ With a man like you in my life this Christmas I feel more ready than ever to celebrate the joy and wonder of this special season. ♥ You are my Christmas dream come true. I love you more than I can ever express. Have a wonderful Christmas, darling! ♥ Our love burns brighter than the star on top of the Christmas tree. May this Christmas and New Year be the best we’ve ever had together! ♥ Christmas is a time for making special memories with the ones you love. There’s no one I’d rather make memories with this holiday season than you. ♥ This Christmas Eve you know where to find me. I’ll be right under the mistletoe eager to share our holiday kiss! ♥ Whether we spend this Christmas nearby or far away, I’ll feel like I’m home for the holidays if the two of us get to be together! ♥ Even though we’ll be miles apart this Christmas our love will keep our hearts closely linked together. I can’t wait until we’re together again. ♥ Meeting you has been the highlight of my year. I can’t wait to spend the holiday season together. Merry Christmas and Happy New Year, my love! ♥ This Christmas, I really can’t afford to give you an expensive gift like I wish I could. Instead, I want to give you something priceless: my heart. ♥ Your kisses and your warm embrace light my heart up like the lights that shine and sparkle on the Christmas tree. I love you! ♥ Whether it’s taking a sleigh ride or curling up by the fire and enjoying some hot cocoa together, I’m so thankful we get to make magical memories together this Christmas. ♥ Christmas is a time for gathering to celebrate God’s gift to us with those we love. As we celebrate the joy, hope, and peace of this holy season I’m thankful God has brought you into my life. ♥ You’re the sweetest boyfriend a woman could ever hope to meet. I can’t wait to surprise you with some extra love and affection this Christmas! ♥ When you look at me with that sparkle in your eye I feel warm from the top of my head to the tips of my toes. Thanks for fulfilling my Christmas wishes! ♥ Christmas is more magical now that you’re in my life. I’m looking forward to all the fun festivities and quiet, romantic moments the season has in store for us. ♥ When I was a little girl I used to dream about what it would be like to meet that special someone and spend our first Christmas together. Now that I’ve met you, I know it’s even more wonderful than I could’ve imagined. ♥ Merry Christmas to a boyfriend who’s sweeter than a candy cane, warms me up more than a cup of hot cocoa, and fills my heart with joy more than the biggest present under the tree! ♥ If I made a Christmas list for Santa of all the qualities I’d want in a boyfriend–like honest, loving, charming, loyal, and handsome–you’d be a perfect match! ♥ Thanks, my love, for all the ways, every day, that you prove your loyalty and love to me. Today on Christmas I want you to know how much I appreciate who you are and everything you do for me. ♥ Christmastime is the time for giving. That’s why today I’m giving you my love, my affection, my attention, and my appreciation. Thanks for being more than I ever hoped to find in a boyfriend. ♥ We go together like the red and white stripes around the candy cane and like the Christmas lights wrapped around the tree branches. Thanks for being my perfect match. Merry Christmas! ♥ Christmas has always been one of my favorite times of the year, but now that we get to spend it together as a couple, it’s even better than before. I’m looking forward to sharing the joys of the season with you. ♥ You’re the most loving, charming, and incredible man I’ve ever met. This Christmas, I want you to know that I love you from the bottom of my heart! ♥ The evergreen Christmas tree reminds me of the lasting love we share together. Thank you for being the best boyfriend I could ever hope to find. ♥ With you close by my side I know that this Christmas is going to be the best I’ve ever had. You’re perfect for me. Have a wonderful Christmas, darling! ♥ Whether we’re kissing under the mistletoe, cuddling by the fire, or opening presents by the tree, we’ll be making holiday memories that will last forever. I’m looking forward to spending each moment of this special season with you! ♥ This Christmas, let’s celebrate the amazing love we share. I don’t need any fancy presents under the tree. As long as I have you, it’s going to be the best holiday season ever. I love you!